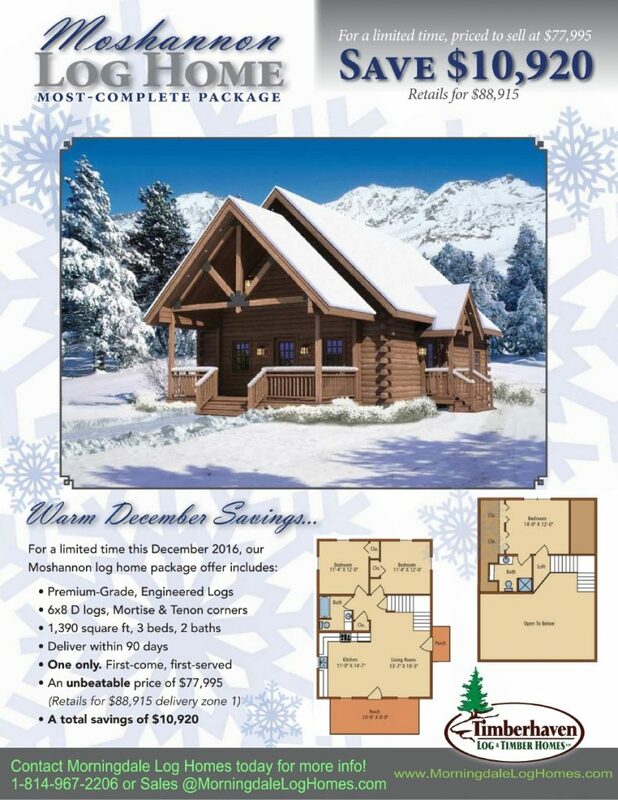 Celebrate A Log Home Christmas Without Getting Snowed! Home→Announcements→Celebrate A Log Home Christmas Without Getting Snowed! ← Let’s “Rock” with a Huge Log Home Discount! A Log Home Christmas means that winter has staretd and you are preparing for the cold temperatures and the feet of snow. Now picture yourself in a nice, warm and cozy log home of your own with a roaring fire going in the fireplace. You can watch the blustery winter through the large windows knowing that you are safe, warm and secure in your beautiful log home. Everyone loves log homes, and we want to be able to help make your log home dream become your dream log home. So, to celebrate the Christmas Season, we are pleased to announce that Timberhaven is offering one of their Moshannon log home models at a savings of almost 13%! All you have to do is contact us and we can get the ball rolling, but you must act before December 31, 2016. The Moshannon features 1390sqft of living space with an open floor plan. Its 3 Bedrooms and 2 baths provide ample spave for a family to live full-time, or you can use it as a vacation home – the choice is yours. You can sit on the 20′ x 8′ front porch and watch the world pass by and get aquainted with nature. Wow, it is so relaxing and peaceful, you will not want to stop! If you hunt, you may just want to stay on that porch and relax, waiting for that monster buck or large Jake to come your way. So now is a great time to contact Morningdale Log Homes and let us make this a special Christmas for you and your family with a nice, cozy log home.